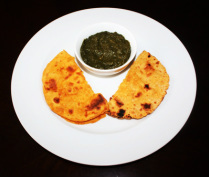 Makai ki roti sarson ka saag with butter accompanied with buttermilk is very popular combination in Punjab. 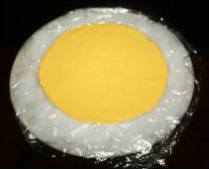 It is made from corn flour and cooked on griddle and topped with butter. 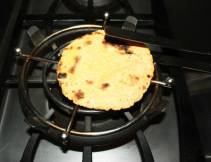 Makki ki roti is generally made during the winter months in Punjab. 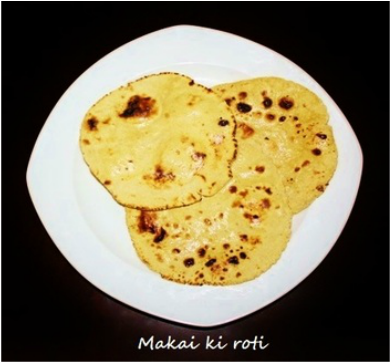 Traditionally ladies make Makai ki roti by hand and roast over kanda (cow dung cakes) on chulha (open fire stove) that gives this roti a smoked flavor and serve with homemade butter. These days we use rolling pin to roll roti and cook on tawa (griddle). 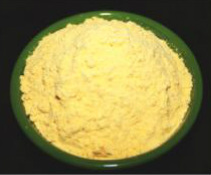 Corn flour has less adhesive strength which makes it difficult to make roti then wheat flour. This is one of the reasons to mix wheat flour with corn flour to make roti. 1. 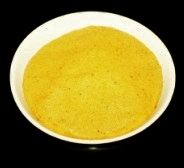 In a bowl add corn flour, whole wheat flour, salt, red chili powder and asafetida,and mix them well. 2. Add little warm water at a time and mix it with flour in a rotating motion from the center of the bowl to outward until it from dough and it cleans the sides of the bowl. It the dough becomes sticky then add more flour or if the dough is dry then add some water. Knead the dough for few minutes until the dough become firm and smooth, just the right rolling consistency. 3. Knead the dough with wet hands and make smooth dough then make a ball and put it back into the bowl, then cover it and keep it aside for at least half hour. 2. 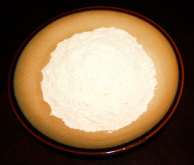 Take some extra whole wheat flour for dusting in a plate. 4. 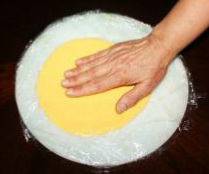 Now dust your hands with the flour and take a portion of the dough and roll it in between your palms into a ball. 6. 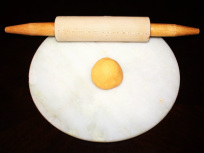 Now place the dough on the rolling board or chakla (Indian roti rolling board) and with the help of a rolling pin (Belan) roll into a 6“circle or the size you prefer. If you get cracks on rolled dough then join the crack by pinching the dough and make it even.You can sprinkle some dry wheat flour on the dough while rolling it so that it does not stick to the rolling pin. You won't be able to make a perfect circle because this dough is just of that nature. 7. Now pick the roti, pat in between your hands to shake off the excess flour. 8. 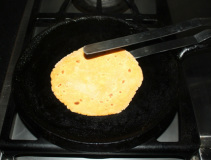 Place the roti on the hot griddle, let it cook, in about 30 seconds little bubbles will start appearing, turn it over and cook other side for 30 seconds. If the roti sticks to the tawa, it means it is not hot enough, if it burn or get too dark quickly it means it is too hot, adjust the heat accordingly. 9. 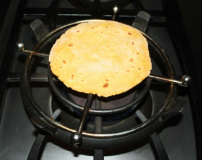 Once both side of the rori are cooked, then with the help of the tongs (chimta) gently lift the roti off the tawa and immediately place it over the flame on the gas stove. 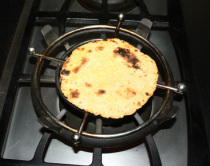 With the tongs keep moving the roti in circular motion about all the time. 10. 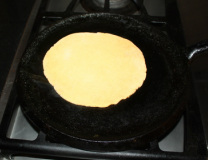 Cook roti from both sides over the flame, when you see black or brown spots on both side of the roti, take it off the stove and slap it lightly over the cooking board to take the flour out, and then apply some butter or ghee. Serve makai ki roti hot. 1. 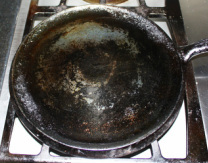 Makai ki roti should be serve immediately hot because after keeping it even for sometime makes them dry and hard. So make sure you make it right when you'll be serving it. 2. 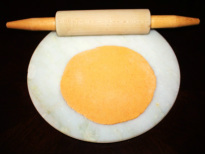 Traditionally, wheat flour is not mixed in the makai ki roti but without the wheat flour, the roti just won’t hold the shape together, adding wheat flour makes the roti easier to roll out. 3. 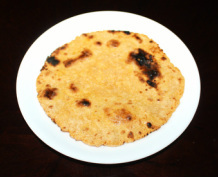 Fresh chopped methi leaves or dry methi leaves or grated radish (Moli) could be added for flavor when making the dough. 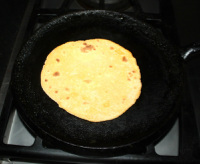 If you prefer to make roti the traditional way only with corn flour you may, it is little difficult and require practice but it get easier. 2. 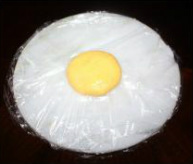 Spread one plastic sheet over the rolling board. 3. Knead the dough with the wet hands for few minutes to make the dough soft. palms into a ball. Flatten the ball slightly with your palm. 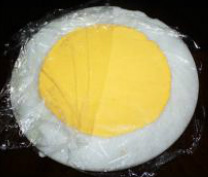 other sheet of plastic and place on the top of the flattened dough. 7. 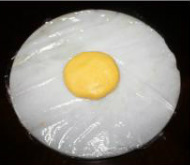 Remove the top plastic sheet and very gently lift the bottom plastic sheet with the roti on it and bring it about 1” to 2” above the hot griddle and carefully transfer the the roti from plastic sheet to hot griddle. Be careful since the rolled dough can break easily at this point. 8. Now follow the process from above from step 8.